It's been another strange season. As usual, it started out with big plans - a return to the Big Horn 100 in June. 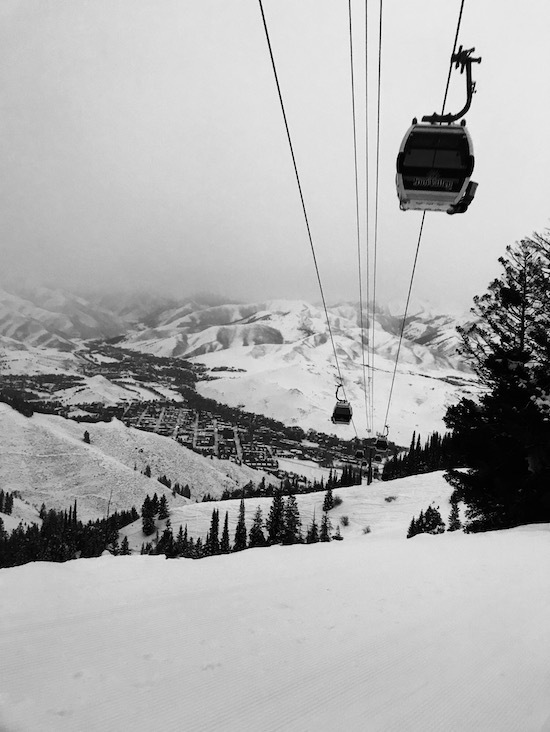 But some pretty severe hamstring tendinopathy forced me into eight weeks off mid-winter and scuttled those plans. 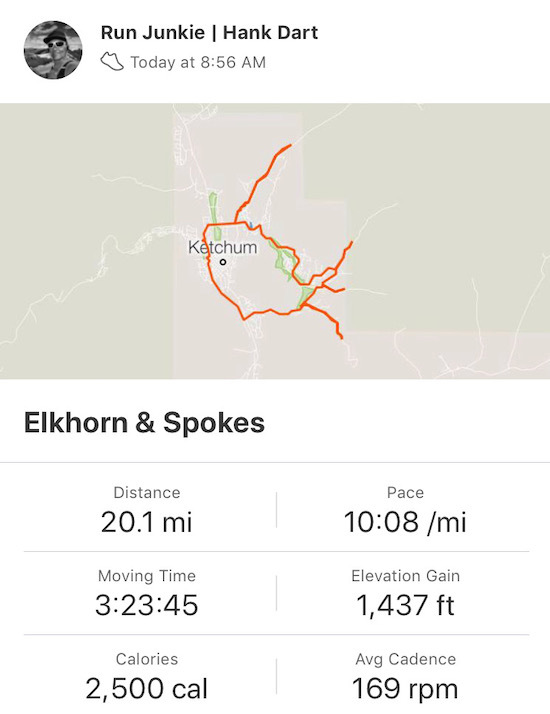 Perhaps a decade ago, I'd have had the training volume to toe the line at Big Horn undercooked and with reduced time goals, but these days I needed some solid, consistent training to get through that race. So, it just wasn't in the cards. Then, a persistent bout of patellar tendonitis complicated the season further but, if I'm honest, was not wholly without some silver linings. 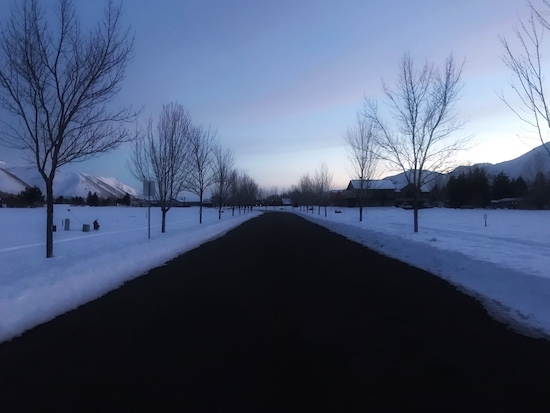 Forced to cut down on volume, I compensated by adding more speedwork and road runs to my training - and finally notched a free-floating but as-yet-unrealized goal of the past five years - a return to a road marathon. 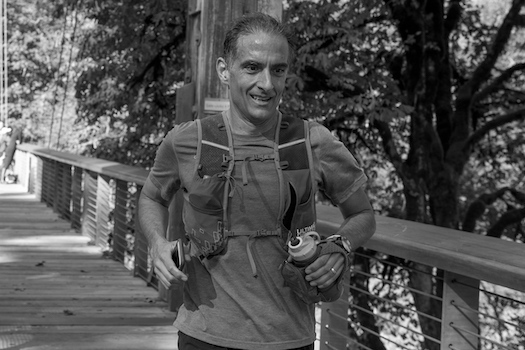 My last road marathon was in 2006, and with 12 extra years, some extra pounds, and a lot of plodding trail miles, I had no idea if I could muster any sort of decent pace, let alone a Boston qualifying time. Turned out, it actually went well. While my 2006 PR was a distant memory, as I knew it would be, my 3:22 at the Pocatello Marathon still felt respectable, and was 8 minutes under the BQ for my am-I-really-in-that-age-group-now cutoff. 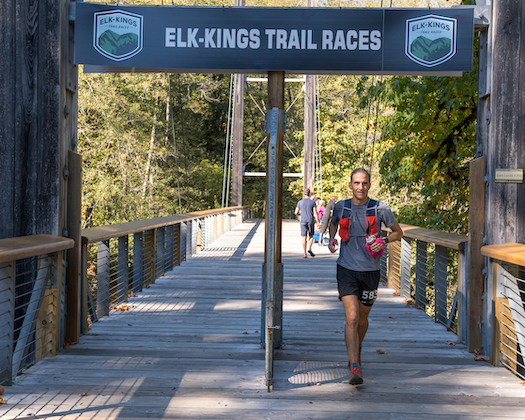 So, feeling buoyed, I set my eyes on one last big(ish) race for 2018: The Elk-Kings 50k in the Tillamook Forest just west of Portland, Oregon. 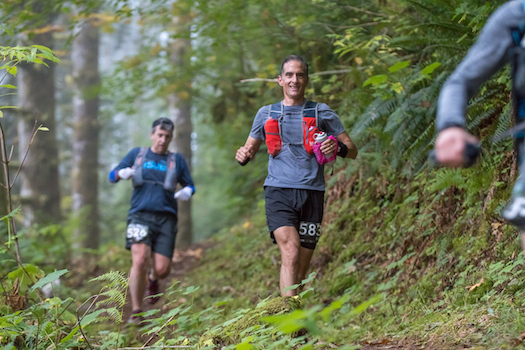 Drawn by its good reviews - and being honest, 3 UTMB lottery point - it was a wonderfully run race on some classic coastal Pacific Northwest singletrack - moss-covered trees, huge ferns, and soft trail. The only thing not PNH classic was the weather, which was an unseasonable but very welcome sunny and 72F. My run itself had its ups and downs. I felt very good for the first two-thirds, hoping for a finish somewhere in the 5:40s. But my stomach took a turn in the last long section, and I had to jog the last 10 miles without eating, crossing in 6:14. Still, I managed an age-group award (3rd) so it wasn't a total meltdown, which can be my specialty. 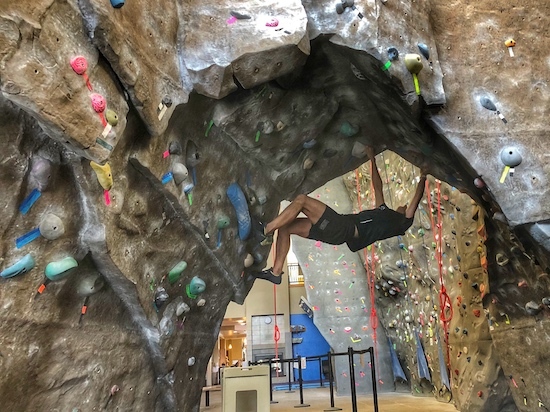 Now, it’s time to just enjoy some unstructured fall running, let some injuries heal, and slowly build hunger for next season, which may or may not involve a trip to Chamonix for UTMB's CCC race - depending on the mood of the lottery gods. Like any ultrarunner, my 2017 was punctuated by some epic outings. 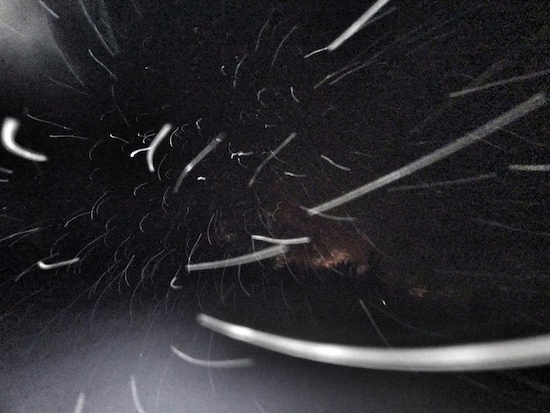 There was the 30-mile February training run in near-blizzard conditions. There was the trip around the "original world" of the Alice-Toxaway loop in the Sawtooth Wilderness. 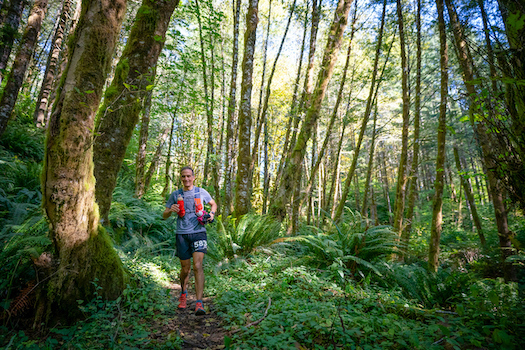 And there was my return, after a nine year absence, to the 100k distance at Gorge Waterfalls. Each of these holds a special place in my memory this year - and together are key parts of an arc that I hope sees me return to being a full-fledge ultrarunner after many seasons of struggling with injuries and, if I'm honest, motivation issues. 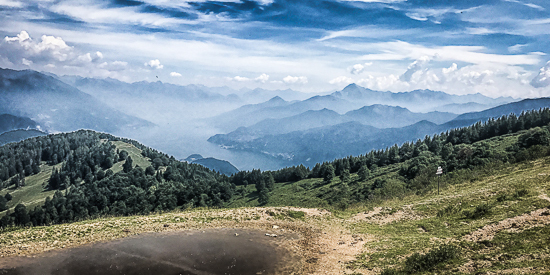 But the real adventure that stood out above the others for me this year was a run in Lake Como, Italy. 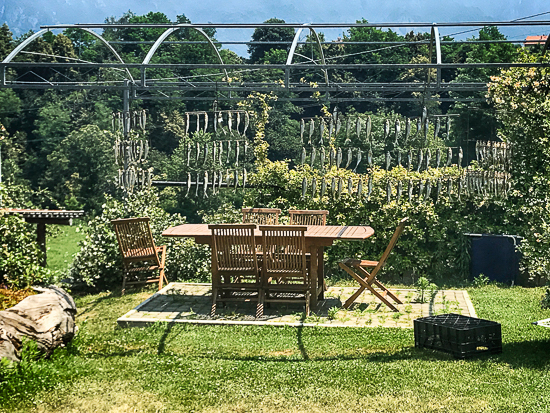 My wife and I had fallen into good luck and were invited to stay with friends in the lakeside village of Torno to help them celebrate their 50th birthdays. 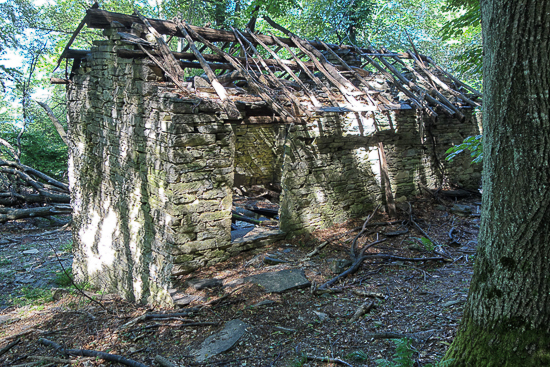 And in planning for that trip, I spent some time - as most of us would do - looking into the local trails. 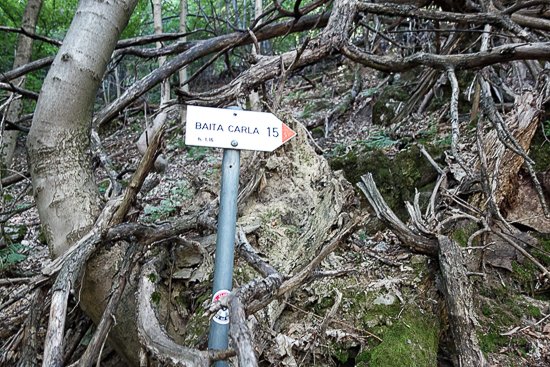 One kept coming up over and over - the Dorsale del Triangolo Lariano trail. It is a ridgeline trail that links the southern lake city of Como to the mid-lake town of Bellagio and bifurcates the large triangular land mass in between the two lower arms of the lake (see map). 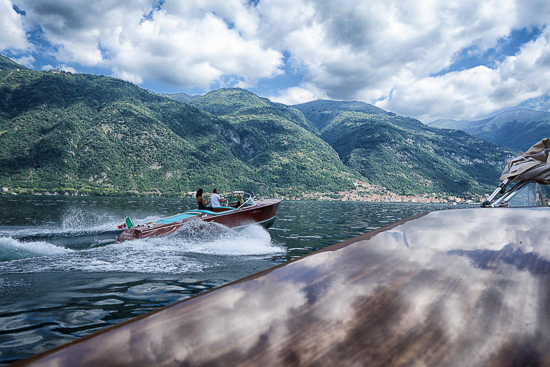 Lake Como is also referred to as Lario, hence the "Lariano." 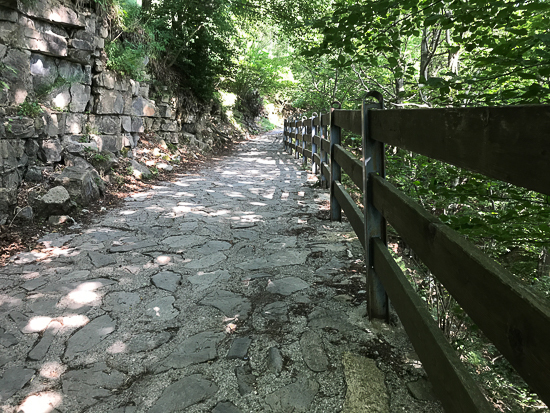 While the Dorsale trail didn't connect directly with Torno, it looked like there were trails out of Torno that would connect. 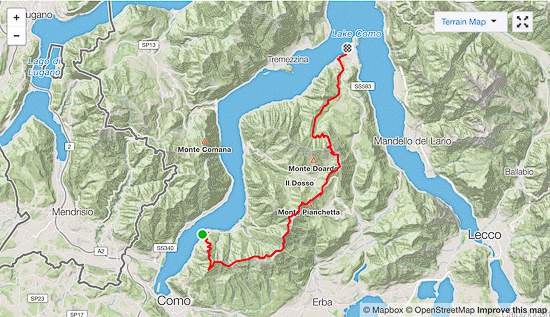 So an idea was born: an 18-22 mile solo run from Torno to Bellagio. 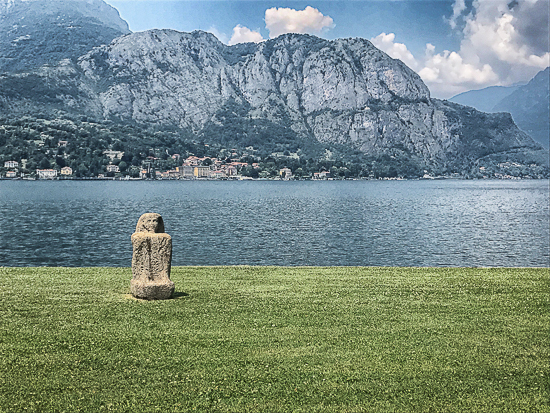 We arrived at Lake Como on June 17, and like most new visitors, I found Lake Como to be very much like what I thought Lake Como would be. It is a large, truly stunning lake surrounded by 3,500 foot mountains that drop directly into the water. Villages and towns dot the shore and, more remotely, the hillsides. And while the likes of George Clooney and Donatella Versace shuttle around in Venetian water taxis and Sikorskys rumble overhead carrying Russian oligarchs to their lakeside villas, there is a real-world sense of community and life that stands out above it all. It simply feels like a very special place. 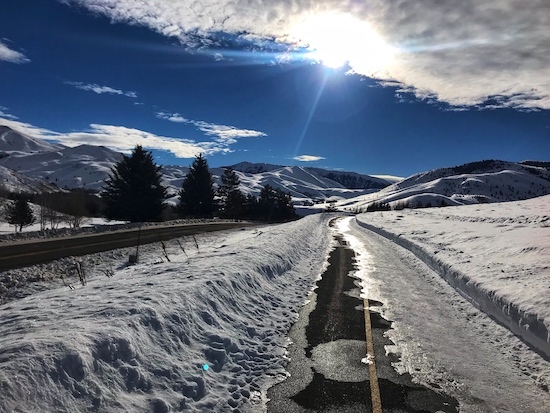 During an afternoon lull the next day, I laced up and headed out on a scouting mission to see if I could find the Dorsale ridge trail. 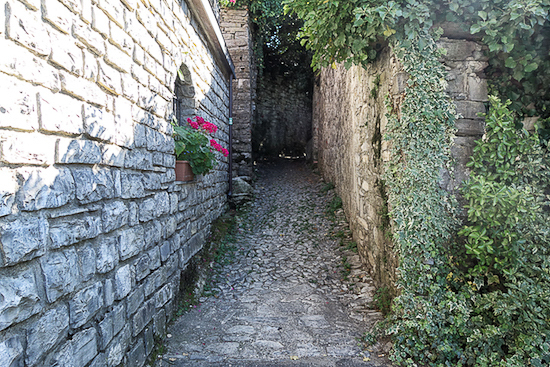 Making my way up the labyrinthine walkways of Torno to the edge of town (see video), I found the unmarked trailhead and headed up. The trail was old - ancient even - in a way we don't really have in the States. 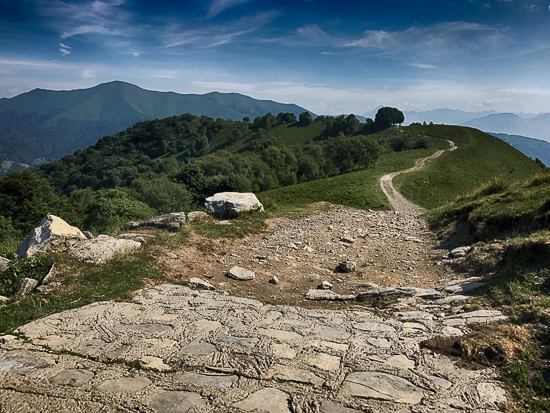 Rock steps made up long stretches of trail, and it climbed 3,000 feet in just under three miles, hooking up, as I'd hoped, with the Dorsale trail near the small village of Baita Carla (Strava). 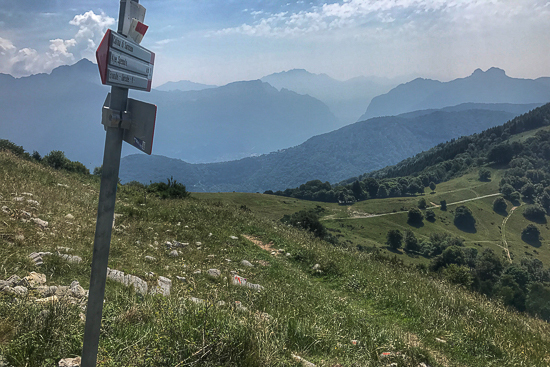 From there, if the guide books were correct, all I had to do was follow the red and white "#1" Dorsale trail markers all the way to Bellagio. Scouting job done. 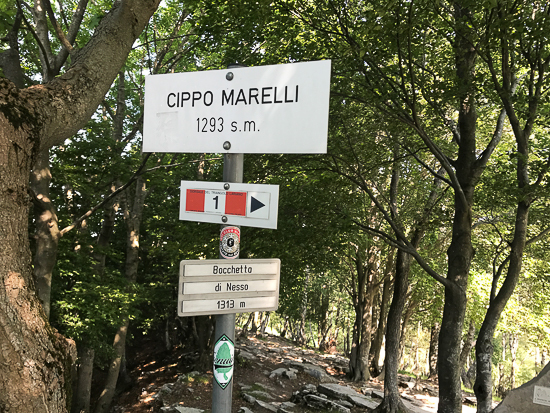 The unmarked trailhead in Torno. Stone steps much of the way up to the ridge and Dorsale trail. The group we were staying with had planned a day trip to Bellagio for lunch and shopping on June 21. So that seemed like the day for my run. 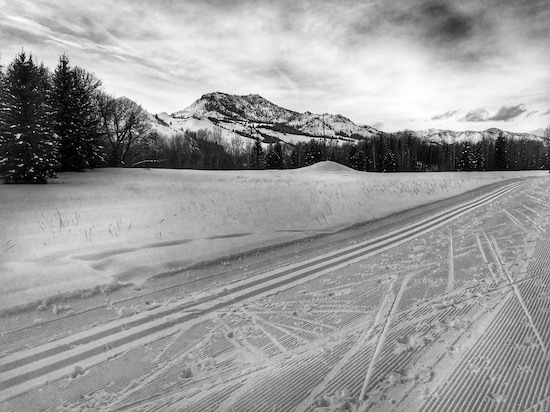 Though, the dawn-patrol start was likely to feel quite early following a long-scheduled night at the opera in Milan the night before (La Bohème). (Yeah, yeah, yeah). But the juxtaposition of La Bohème and a long run to Bellagio was hard to resist, and grand memories often parallel sleep deprivation. 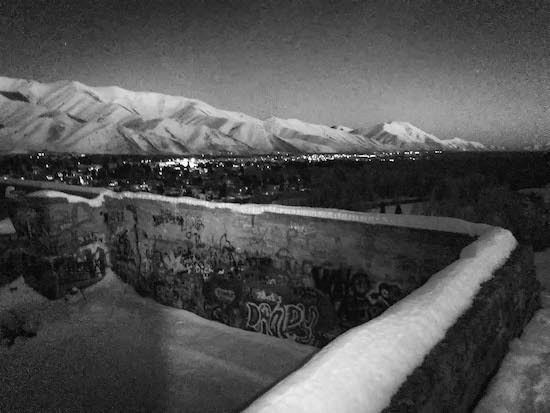 The solstice it was. Pre-run warm up. Taking it all in at La Scala in Milan. So, the morning after the opera, with Che Gelida Manina still echoing in my ears, I drank some coffee, filled my bottles, and headed out - giving myself about 5-6 hours to make it to Bellagio to meet the group by lunchtime. 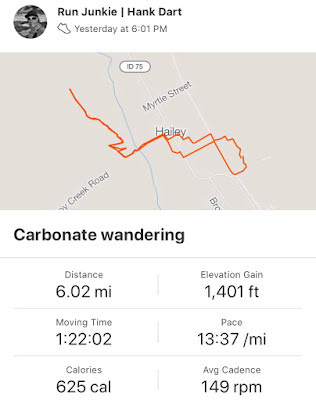 By 7:00 am, it was already warm, and weighted down with a full pack, I took a measured pace on the opening three-mile climb to the Dorsale trail. 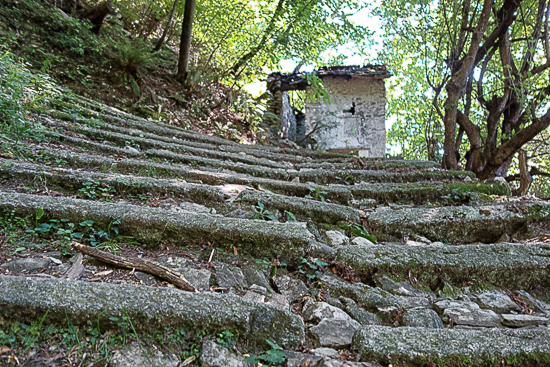 Much of that section of hillside trail is under dense canopy, with few views to speak of, but many things to see - small villages accessible only by foot or motorbike, Catholic shrines, and centuries-old structures. Some in good repair, some not. My GPS route, with my flyover below. Flyover from my GPS data. Opening miles up to the Dorsale trail at Baita Carla. At Baita Carla, I turned north on the Dorsale, which, true to its name, largely follows the dorsal fin ridgeline of the mountains. When the main trail traverses the ridge, there was often a "cresta" spin-off that directly followed the ridge. I took one "cresta" section, which was technical, narrow, and slow-going - and decided I'd better stay on the main route if I were going to make it to Bellagio in any reasonable amount of time. 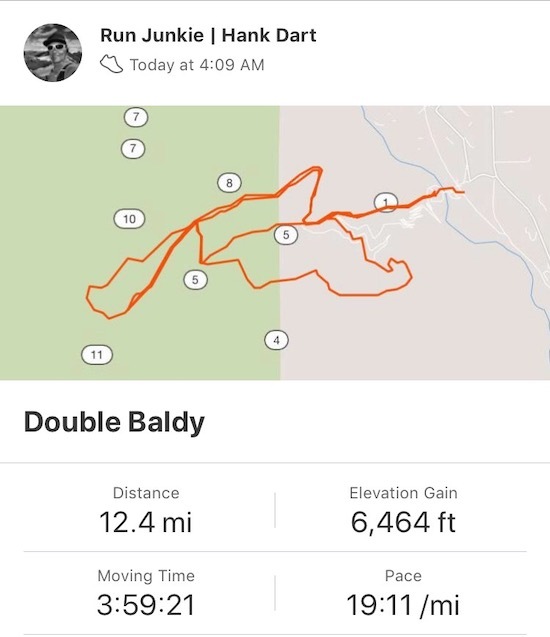 While the main trail isn't technical, it does climb and descend a decent amount, and with an inversion that morning, it was feeling hot and exposed. My three liters of water was starting to look insufficient. So around mile 10, I started to ration. And after three more exposed miles with a light tailwind, I started to wilt. Open ridge views that felt hot, with an inversion and light tailwind. 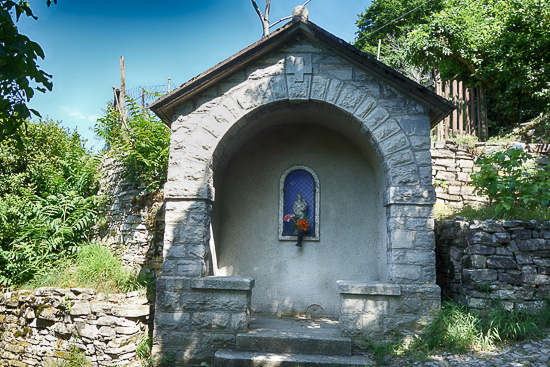 With the popularity of certain sections of the Dorsale trail - and it being near tourist high season - I was hoping to come across a refugio (mountain hut) or two where I could refill bottles and maybe even grab an espresso and snack. No such luck, however. While I passed one shuttered refugio directly on the Dorsale, others were a few kilometers off the route, and I couldn't spare the time (or distance or energy) for the round trips. So, I was very happy to come across a full-scale cafe at Colma di Sormano around mile 13 (flyover at 1:00). 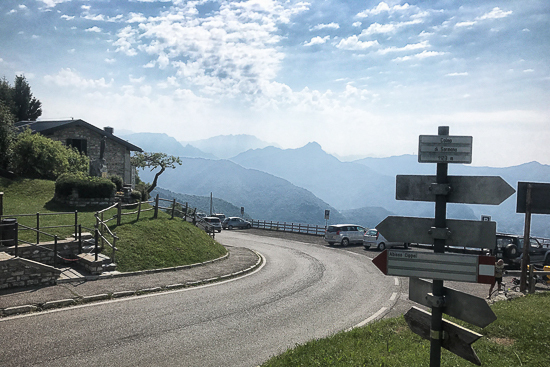 It's set at the top of a mountain pass road that connects the eastern side of the lake with the western side and is also a storied climb of the Giro di Lombardia pro cycling race (video, see 10:00). With my five words of Italian, I was able to buy two bottles of water and a coke. I felt buoyed, now comfortably set on water and calories for the rest of the run. Happy for the water and coke. 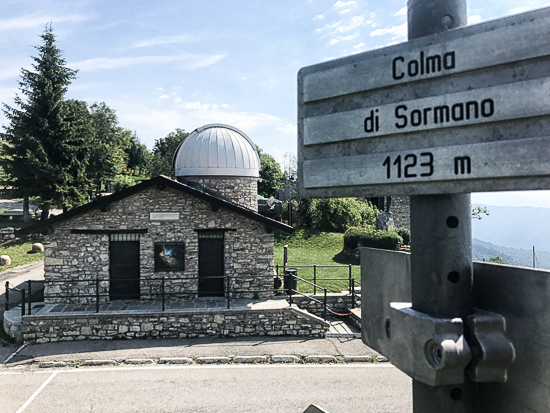 Ecstatic to see the storied Colma di Sormano in person - and by happenstance. 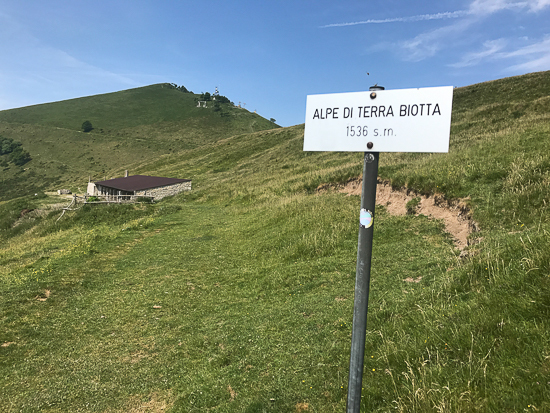 From the Colma di Sormano, the trail undulates the next six or seven miles, reaching a high point of around 4,600 feet near Terra Biotta. Throughout this section, the Dorsale comes out of the trees and there are beautiful views of the eastern leg of the lake, looking much more distant than I'd realized. From that highpoint, the trail gradually descends off the ridge, through an abandoned mountain bike park and small settlements, with municipal life slowly taking hold. 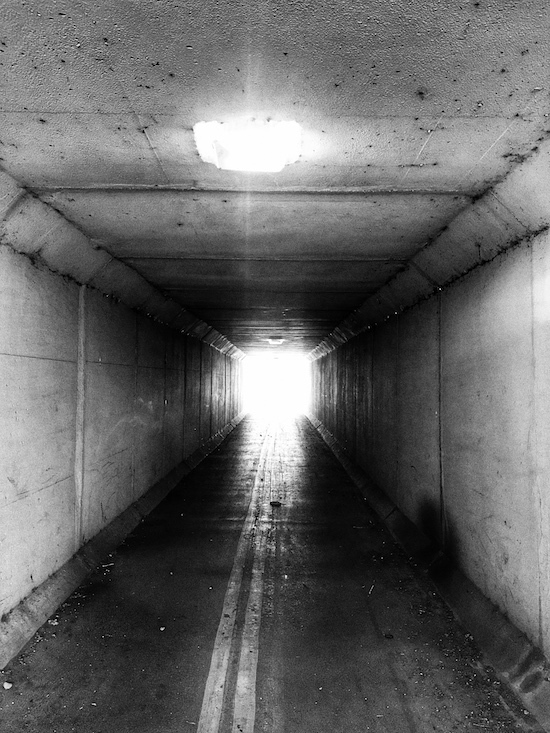 It was on a mile-long road section here where I lost the trail for the only time - taking a wayward out-and-back to a beautiful hillside chapel (flyover at 1:25). The last part of the trail turned to all singletrack, winding through small farms and villages before it terminated on a road about two miles above Bellagio. Red and white #1 signs mark the Dorsale trail. Looking down on the eastern leg of the lake, beginning the long, gradual descent to Bellagio. On the road, I passed more houses and a hospital and a helipad. Fish were set to dry in the sun at one home. When I was within a mile of Bellagio and the tourist traffic had started to pick up, I called my wife to check in. The trip had taken nearly six hours, and I had hoped I hadn't missed the group completely. I was relieved that I had not. 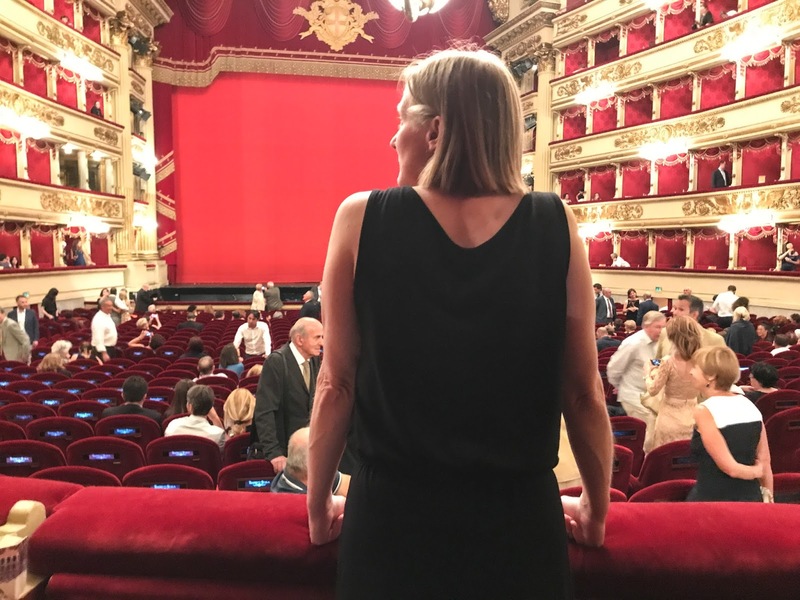 They had arrived just five minutes before, and my wife was walking through the Gardens of Villa Melzi, which was just a quarter mile down the road from where I was calling. I jogged a few more minutes up to the gates of the gardens, stopped my watch, and cooled down alongside her and among the manicured lawns and Japanese maples. We then had pizza in the square, did a bit of shopping, and hopped on the boat back to Torno. 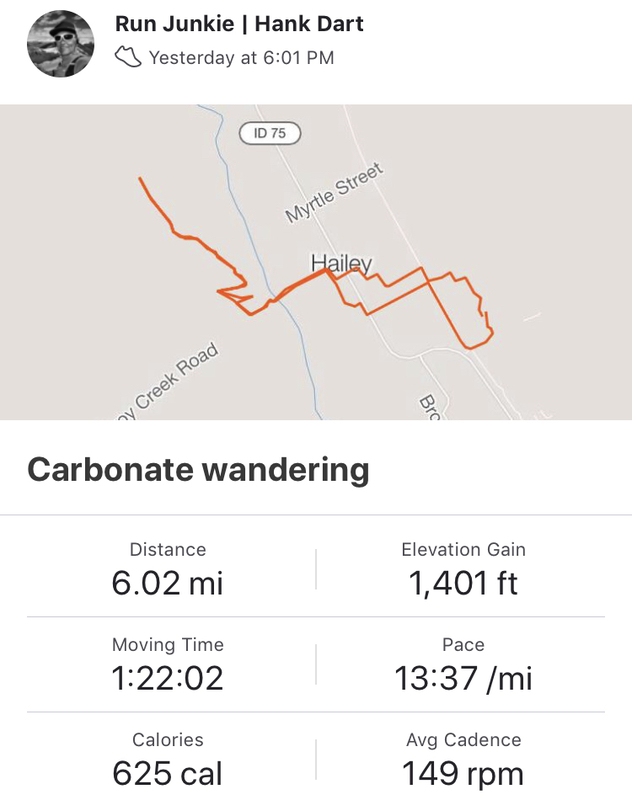 All told, it was close to 24 miles with around 6,600 feet of vert (stats below and here) - and capped off a 24 hour period I doubt that I deserve - but know that I fully appreciate and won't easily forget. Cooling down at the Gardens of Villa Melzi. 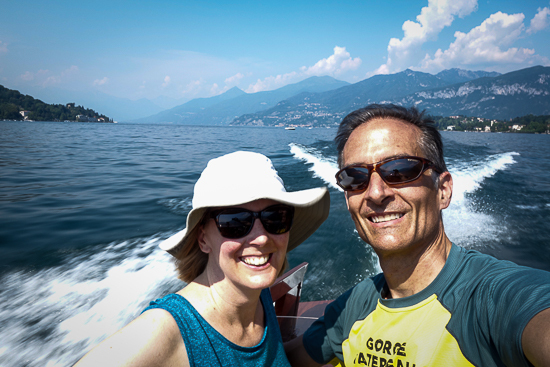 With my wife on the boat ride back to Torno.